Customization reigns supreme in today’s kitchens and baths, and when it comes to countertops, the options are endless. Combining traditional craftsmanship with 21st-century technology, Sprovieri's Custom Counters is recognized as offering one of the largest, most diversified portfolios of surfaces in the country. As a result, their talented artisans have fabricated and installed the most exceptional and unique projects in Chicago and beyond. Family-owned and -operated for three generations, Sprovieri's fabricates natural stone, engineered quartz, solid surface materials and more. "We are one of the most innovative shops in the country, pushing the boundaries of creativity, style and functionality-from custom sinks, shower bases and wall cladding, to logo and thermoforming capabilities," CEO Chuck Sprovieri says. "We ensure each project is a reflection of your desired vision; this is why our middle name is 'Custom.'" Adding to its accolades, Sprovieri's is one of only two Natural Stone Institute-accredited fabricators in Illinois, achieving the industry's highest standards for business activities, product knowledge, fabrication and installation. In today’s kitchen and bath designs, we are continuing to see more options in material finishes, going beyond polished and honed to rugged-leathered and concrete. We demonstrate innovation born from experience, applying these materials to new designs and uses. Other current trends include large panels for shower walls, eliminating grout, and modern, trough-style sinks. 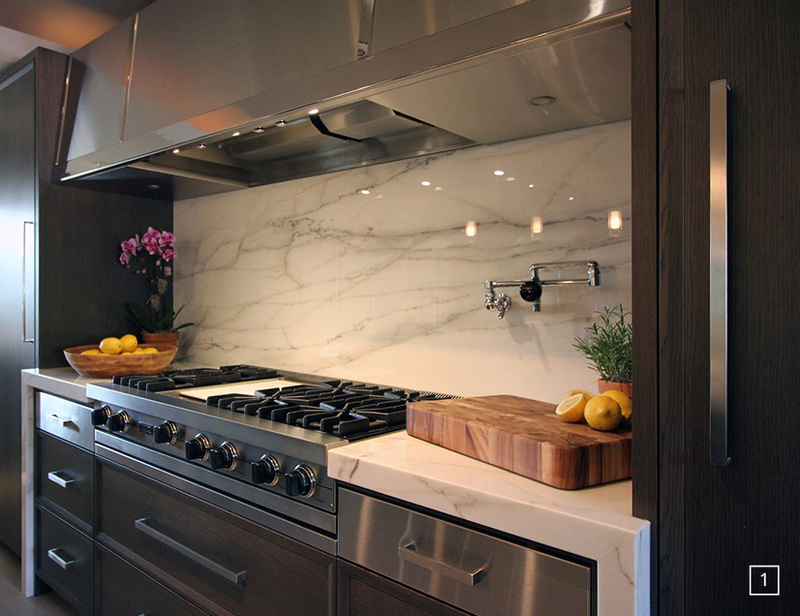 Waterfall legs frame the rangetop in this kitchen, where a full-height marble backsplash doubles as a work of art. A perfect gathering place with seating for six, this large island takes center stage with its Lincoln Gold marble sourced from Terrazzo & Marble. Sprovieri's famous miter edge builds up the thickness of any countertop for a more substantial, modern design. Born and raised in the design industry, president Steve Sprovieri had a distinct vision in mind for his own kitchen remodel. He entrusted Rick Schaudek with cabinetry by Bella Custom Cabinets, and designer Mark Menna to bring his vision to life. To top it off, Sprovieri and his wife, Caryn, chose Lincoln Gold marble from Terrazzo & Marble. With the assistance of designer Tonia Calmeyer, the thoughtful use of colors and textures, from polished-white marble and dark cabinetry, to rugged-stone columns and distressed beams highlighted by stainless-steel accents, blends to become a casual, yet elegant design. The space is meant to be enjoyed by family and friends for years to come.